TOKYO – Oct. 26, 2016 – mixi, Japan’s leading social networking service and smartphone gaming provider, today announced the global launch of MARVEL Tsum Tsum, a connect-and-erase puzzle game featuring the world-famous Super Heroes and Super Villains from the Marvel Universe modelled in the classically popular Tsum Tsum style. The game, which offers a unique 2-player co-op mode, is now available as a free download, with in-app purchases, in 153 markets on the Apple App Store® and 121 markets on Google Play™. As of today, gamers from the UK, France, Italy, Germany, Latin America, Korea, Hong Kong, Taiwan and many more countries and regions can enjoy the popular puzzle game. Following the successful US launch of the game this summer, players across the globe can now enjoy frenetic, action-packed missions. MARVEL Tsum Tsum gives players of all ages the chance to save the world as their favorite Super Heroes such as Iron Man, Captain America, Thor, Black Widow, Hulk, Ant-Man, Star-Lord, Gamora, Rocket Raccoon, Spider-Man, and many more! Battle the evil forces of the Marvel Universe including Loki, Ultron, and Venom. Gameplay is simple yet strategic: connect three or more of any of the same Tsum Tsum by tracing lines on the screen to eliminate them and save the day. The more you connect, the greater the power you’ll wield! Erase your chosen Super Hero Tsum Tsum to collect energy, release devastating skills and special attacks, and leverage abilities to support your friends in the new Multiplayer Battle mode. Multiplayer Battle mode allows players to team up and defeat Super Villains for greater rewards. Players can team up with a friend and play 2-player co-op, in addition to many levels of single player gameplay. 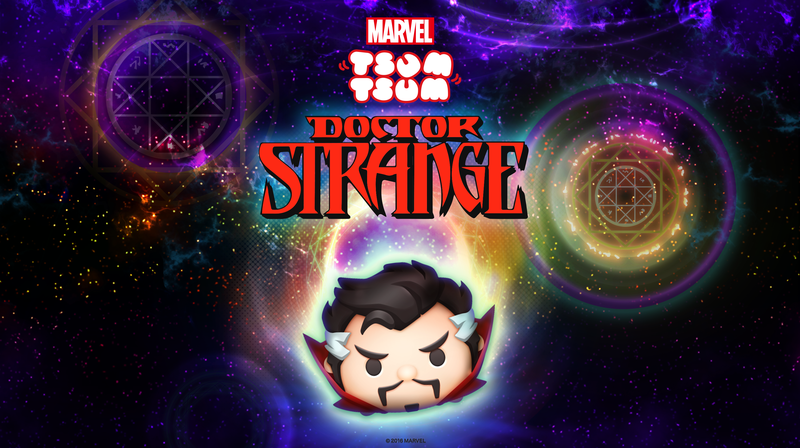 Celebrating the upcoming release of Marvel’s Doctor Strange, MARVEL Tsum Tsum players will be able to use Doctor Strange and The Ancient One to defeat Mordo to get more Tsum Tsum! MARVEL Tsum Tsum is developed by NHN PlayArt Corp., published by XFLAG, a mixi game development studio, and officially licensed by Marvel Entertainment in cooperation with The Walt Disney Company (Japan) Ltd. MARVEL Tsum Tsum is available to download for free, today. The mission of mixi Group is to “creating a new culture through internet services that enrich lives and bring happiness.” The mixi Group of companies strive to create new markets by providing fresh values centered on communication. We began our business in 1997 with the job posting website for “web people”, “Find Job!” Since then, we have launched Japan’s first social networking site, “mixi”, and the smartphone game “Monster Strike”, which has over 35 million users in total worldwide. We are currently engaged in the development and operation of new services, such as beauty app “minimo” and “Family Album – Mitene”, an app where users can share photos and videos of their children. The mixi Group has expanded to include new business activities, with the addition of nohana, Inc., provider of family photo book service “nohana”; Diverse, Inc., provider of “Poiboy”, the communication app where women take the lead; MUSE & Co.,Ltd, provider of the women’s fashion commerce service “Muse & Co.”; and Hunza, Inc., provider of the ticket flea market app “Ticket Camp”. Through these new business activities, we are providing a wider range of services that further enrich the lives of our users. With the goal of further development of the entertainment business, XFLAG™ STUDIO was established within mixi, Inc. in August, 2015. At XFLAG STUDIO, we look to bring games such as “Monster Strike” and “MARVEL TsumTsum”, and other exciting “full-throttle adrenaline” games and video content to the world, under the theme of “extraordinary adventures”.